This youth desk and hutch is a great addition to any child's bedroom. It features three storage drawers and one pull out key board tray. Every child wants their very own desk to do their homework, work on the computer and keep their things organized. The hutch features two doors and an open area with shelves for storing and display books, toys, office supplies or anything else. Pair with the desk chair for the matching seat. The Versaille Youth Desk & Hutch by New Classic at Wilcox Furniture in the Corpus Christi, Kingsville, Calallen, Texas area. Product availability may vary. Contact us for the most current availability on this product. 1040-091-C Desk 1 44" 22" 30"
1040-092-C Youth Desk Hutch 1 46" 13" 48"
Handles & Hardware Brushed metal hardware knobs. Case Detail Soft curves, shaped moldings, and bracket feet. Drawer / Shelf Construction English dovetailed drawers. Drawer Suspension Euro side mounted drawer glides for smooth and easy operation. Case Construction Birch solids and veneers. Solid case bottoms. In the classic tradition of Louis Phillipe, the Versailles collection has the grace and charm that one expects from this style. This bedroom features soft curves, shaped moldings, and lovely cast hardware accented by the pure Bordeaux finish. 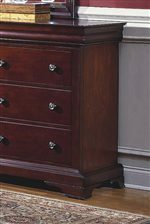 Although this group is centuries old in style, a 21st century lift-top chest (with mirror & felt -lined compartment) and a media cabinet has been included with this collection. This would be the perfect addition to your home. It is also available in youth bedroom that will dress up your child's bedroom. Your child will love this very grown-up version of this most famous cherry sleigh bed. This collection works in a guest room also. The bunk bed is really nice. It has an under bed drawer for extra storage as an option. The Versaille collection is a great option if you are looking for Traditional furniture in the Corpus Christi, Kingsville, Calallen, Texas area. 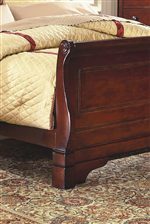 Sleigh Footboard with Paneling and Carved Moldings. Scalloped Feet and Molded Case Bottoms. Browse other items in the Versaille collection from Wilcox Furniture in the Corpus Christi, Kingsville, Calallen, Texas area.